In the month of November we arrive at the last Sundays of the year according to the Christian calendar. From ages past, the focus of this period of the year has been directed to ‘the last things’, to the end of times, the great divorce. Depictions of the Last Judgment were meant to confront us with questions such as: Where do I stand? On the side of Christ? Am I prepared to comply with God’s will for my life? 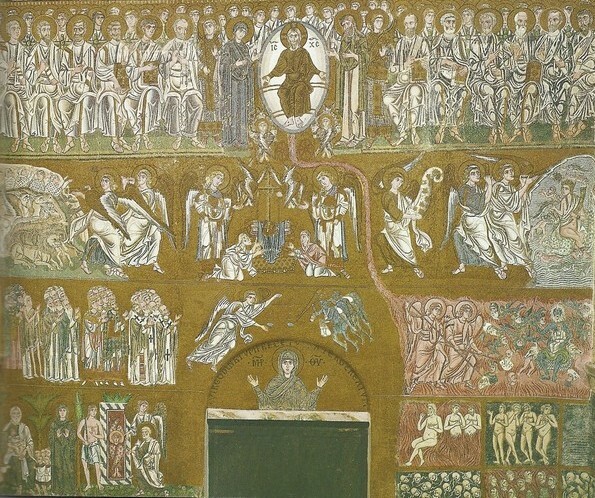 In Christian art of the Byzantine Empire the portrayal of the Last Judgment finds its final form in the 11th century. The huge and impressive rendering of this subject on the whole west wall of the basilica of S. Maria Assunta on the island Torcello (near Venice) is a beautiful and clear example of this. It is the teaching of the church concretized by visual means. This complex mosaic from ca. 1200 is composed of a great number of elements from biblical sources, especially from passages in the gospels about the end of times and the Book of Revelation. But also non-biblical imagery can be identified: the snakelike stream of fire winding its way down to the sea of hell-fire; the scale in the hand of the Archangel Michael used to weigh the souls of the deceased (originating from Egypt); the monstrous figure in the hell-fire (reminding us of Hades, the Greek god of the underworld) and the six compartments in hell for various punishments. The mosaic consists of six registers. From the ridge of the roof one can draw an imaginary line straight down. In the three upper zones Christ is the central figure. 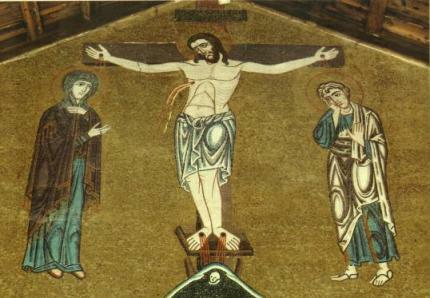 At the top the crucified Christ; beneath this, Christ climbing up out of the realm of death with the cross of victory in his hand, while pulling up Adam behind him as the first of the Old-Testament ‘believers’; and in the third register the glorified Christ, seated upon a double arch in a mandorla. This makes very clear that the judge of the Last Judgment, with wounds in his hands and feet, will be the same as the crucified and resurrected one, who experienced the very depths of human existence. In the fourth zone the still empty throne, the seat of the judge, has been placed for the returning Christ, flanked by the Archangels Michael and Gabriel. On the back of the chair is a Greek cross with a laurel wreath – the wreath of victory. And, on the seat lies a dark blue cloth with The Book of Life on top of it (Revelation 20:12). In the fourth register we see the resurrection of the dead upon the sounding of the trumpet by the angels (Matthew 24:31). On the left the graves open themselves and the dead rise from the earth. Wild animals spit out the people they devoured. On the right the sea and the sea monsters give up their victims (Revelation 20:13). Next to this an angel rolls up the starry sky like a scroll, as if it were a roll of wallpaper (Isaiah 34:4 and Revelation 6:14). On registers five and six the great divide is represented. The Archangel Michael is the central figure here, with the scale on which he weighs the souls of people and their walk of life. Two demonic figures try to tip the balance of the scale in such a way that they can trick the souls out of Michael’s hands to drag them along to hell. Mary, portrayed underneath as the praying Virgin, calls on God for his mercy. To the left of Michael are the chosen ones, destined for heavenly bliss, with their eyes on the returning Christ. To the right the condemned swim in a pool of fire, pushed in by angels. And then in register six we see the contrast between the chambers where the condemned ones have to undergo their eternal punishments to the right and the redeemed who go to paradise to the left. In paradise from left to right: Abraham with the soul of Lazarus (‘in Abraham’s bosom,’ Luke 16:19-31); around Abraham the souls of the saved represented as children, suggesting that becoming like a child makes one fit to enter the Kingdom of God; then Mary, the Mother of the Lord; the Good Thief crucified next to Jesus, to whom he said: ‘Today you will be in paradise with me;’ and finally the cherub who protects the gate of heaven together with Peter (with key) and an angel. The longer you look at this mosaic, the more the power of its expression increases. It is a total NO to the law of the jungle. It is not a sermon of hellfire and damnation, but an urgent call to open-heartedness and dedication, to lives lived with care and vigilance, also in our day and age, in which it is highly necessary that swords should be forged into ploughshares. Peter den Hengst is an emeritus pastor of the Protestant Church in the Netherlands (PKN). Before he retired he worked in Zwolle. He is very interested in the visual language of Christian art and lectures about various themes in this area.